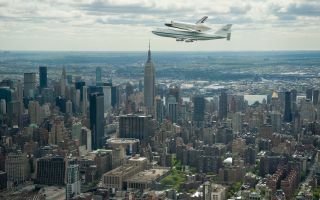 In this space wallpaper, Space shuttle Enterprise, mounted atop a NASA 747 Shuttle Carrier Aircraft (SCA), is seen as it flies near the Empire State Building, Friday, April 27, 2012, in New York. Enterprise was the first shuttle orbiter built for NASA performing test flights in the atmosphere and was incapable of spaceflight. Originally housed at the Smithsonian's Steven F. Udvar-Hazy Center, Enterprise will be demated from the SCA and placed on a barge that will eventually be moved by tugboat up the Hudson River to the Intrepid Sea, Air & Space Museum in June.